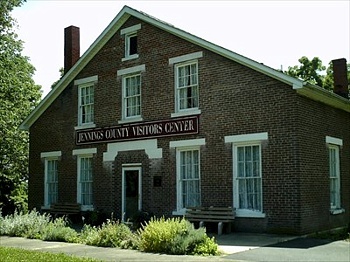 The Jennings County Visitor Center was located at the parks main entrance off of State Highway # 3 & 7 in the historic William Read Home (1850). Now this building is only used by the Park's Department, but we still have displays, brochures, and will be glad to assist you! Jennings County Parks and Recreation Department offices are within this elegant Greek Revival style early Indiana pioneer home. The William Read Home was built in approximately 1850. The home owner had started his business just down the hill by the river and a small stream inlet. The ruins of this stone cutting mill still exist and are in conjunction with a newly constructed model of the original mill, the Vinegar Mill. Building materials for this pioneer home were harvested and manufactured primarily in the vicinity. Foundation stones and widow sills were quarried at the Vinegar Mill. Native trees of oak and tulip were used for structural framework and flooring. The bricks for the building were baked on the property as well. The brick pattern for this home is very unique. Today... the Visitor Center receptionist will be glad to assist you in your park scheduling. Park Office and Visitor Center are open Monday thru Friday 8 to 4, minus lunch from noon to 1. Information on the camping and trails can be picked up at the Visitor Center when closed in a vestibule area by the front door.